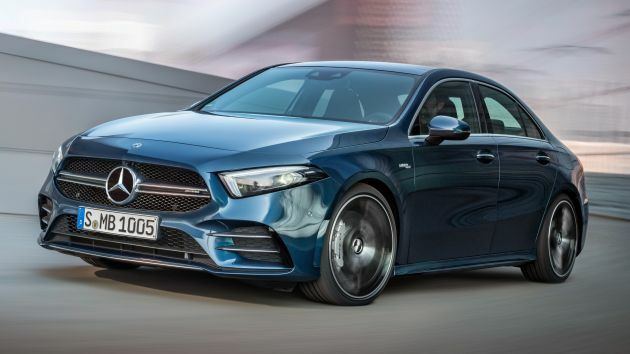 While the world awaits the next generation of the full-fat Mercedes-AMG A 45 hot hatch, Affalterbach has added a boot to the midrange A 35 to create this, the Mercedes-AMG A 35 4Matic Sedan. The four-door shares all the goodies with its tailgate-wearing sibling, starting with what’s under the bonnet. There, you’ll find the same 2.0 litre turbocharged four-cylinder petrol engine – it’s the A 250‘s M260 mill, lightly breathed on to produce an impressive 306 hp at 5,800 rpm and 400 Nm of torque from 3,000 to 4,000 rpm. It’s paired to a seven-speed AMG Speedshift 7G dual clutch transmission with gear ratios tuned to improve acceleration at all speeds. 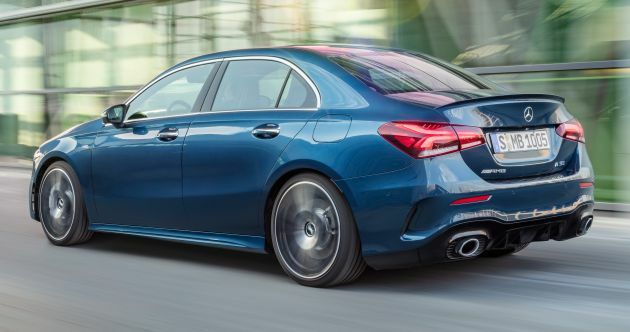 All that power and torque gets sent through the variable AMG Performance 4Matic all-wheel drive system, which can send up to 50% of torque to the rear wheels through an electro-mechanical multi-plate clutch. With the Race-Start launch control system, the A 35 sedan will sprint from zero to 100 km/h in 4.8 seconds – just 0.1 seconds slower than the lighter hatch. To handle the extra power, the body-in-white has been strengthened with a new “shearing plate” at the front of the car. This aluminium panel underneath the engine, together with additional diagonal bracing, increases torsional rigidity for more precise turn-in and greater toe and camber stability even at speed. Suspension continues to be provided by MacPherson struts at the front – with unique axle geometry and lightweight aluminium control arms – and a four-link setup at the rear that uses components from the outgoing A 45. You also get adaptive dampers as part of the optional AMG Ride Control suspension, along with speed-sensitive electro-mechanical sports steering and AMG Dynamics torque vectoring by braking. As per the hatch, the sedan gets the full AMG Line styling package, complete with the aggressive front air intakes and deeper side skirts. The twin-louvre grille and gloss black shrouds on the corners of the bumper set the A 35 apart from lesser models, while the rear gets a bootlid lip spoiler and an entirely different diffuser insert with twin circular exhaust pipes. A selection of 18- and 19-inch wheels hide the larger cross-drilled brake discs, measuring 350 mm at the front and 330 mm at the rear. They are clamped by four-piston monoblock callipers at the front, radially bolted onto the AMG-specific steering knuckles, as well as single-piston callipers at the rear. If even greater visual aggression is what you’re looking for, you can opt for the AMG Aerodynamics Package that adds a protruding front splitter, front flics, a larger rear spoiler, shrouds for the (fake) rear air vents and even more pronounced diffuser blades. The interior retains the A-Class’ party tricks, including the giant flatscreen display panel, Mercedes-Benz User Experience (MBUX) infotainment system and the “Hey Mercedes” Linguatronic voice control. And of course, unlike the hatch, the sedan gets a separate boot that measures 420 litres. Features specific to the A 35 include unique displays for the instrument cluster as well as an optional AMG Performance steering wheel. This flat-bottomed unit gets two configurable buttons and a rotary controller that can be used to access the Slippery, Comfort, Sport, Sport + and Individual drive modes on the AMG Dynamic Select system. The buttons and the controller all come with colour displays. Also available as an option is the AMG Track Pace telemetric system, which records over 80 vehicle-specific data such as speed and acceleration, as well as lap and sector times when driving on a circuit. It features pre-stored tracks such as the Nürburgring and Spa-Francorchamps, allows users to record their own tracks and will even show the ideal racing line on screen through the MBUX Augmented Reality function. New styling and eye-catching paintjob, I like it! The proportion is wrong . Ugly.